We review the Canon Powershot SX70 HS - Canon's update to the SX60 adds 4K video, and a 20.3mp BSI CMOS sensor. Find out what else is new with the SX70 in our review. The Canon Powershot SX70 HS adds a 20mp sensor and 4K video recording to the SX60, and subtle changes to the camera improve the handling, but a high price means you're going to need to be a big Canon fan to choose this over the competition. 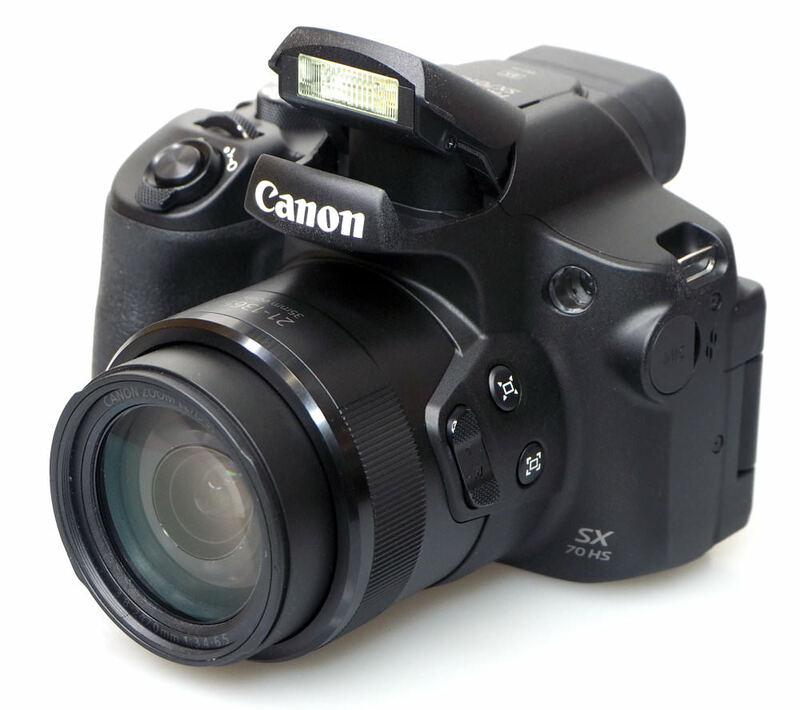 The Canon Powershot SX70 HS with a 65x optical zoom lens features 4K video recording. The 65x optical zoom lens is equivalent to 21-1365mm in 35mm equivalent terms. There’s a 20.3-megapixel sensor, and 0cm macro focus. The camera can shoot at 10fps, or 5.7fps with continuous AF. A new DIGIC 8 processor is included, and the camera will shoot panoramic images. The ultra-zoom or bridge camera* has always been a tempting option for many, with an impressive level of optical zoom, the camera design includes styling that makes the camera look like a small or "mini" DSLR and with that it also means that there's a large grip, an electronic viewfinder, and a large lens barrel to hold on to. 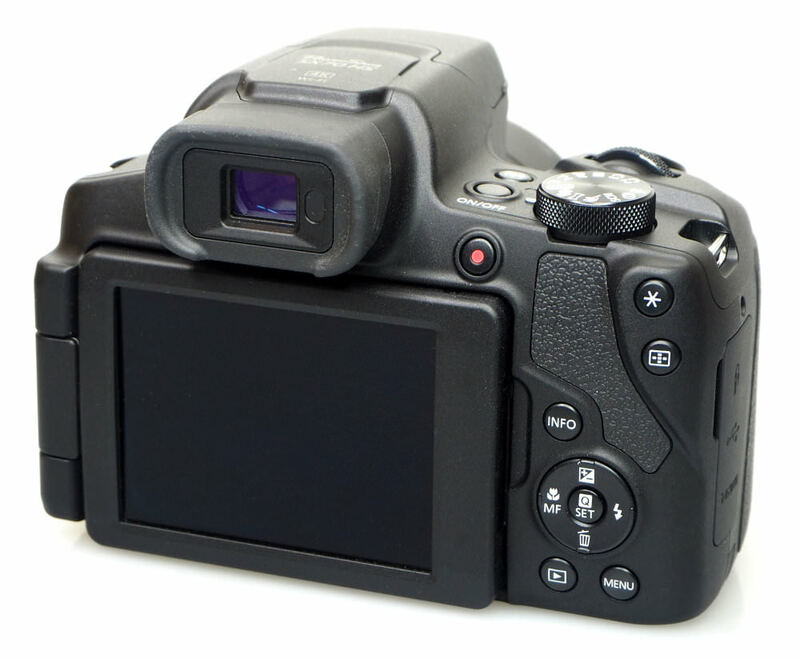 This means the camera should be comfortable to hold and gives you the choice of using the rear screen or the electronic viewfinder when shooting. You'll also find manual controls, as well as raw shooting. *The bridge camera is supposed to "bridge" the gap between a DSLR/SLR and a point-and-shoot camera. 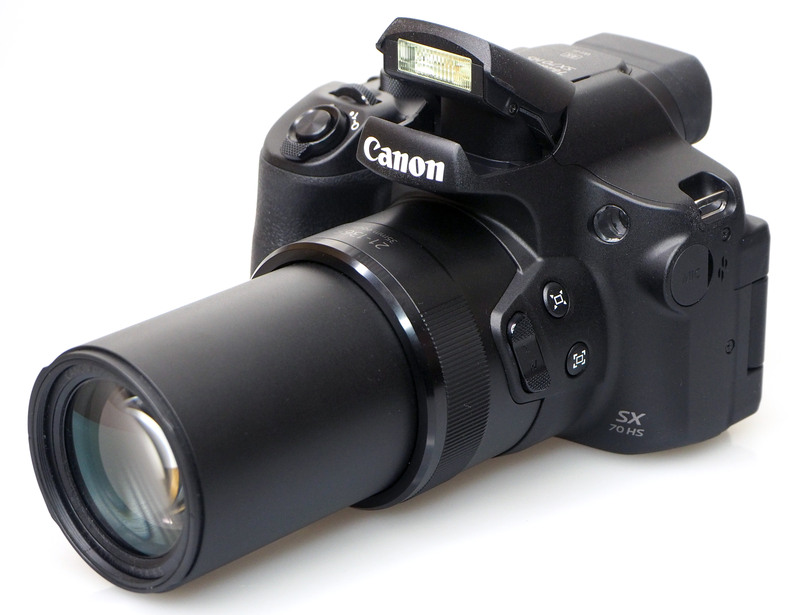 The 65x optical zoom lens gives a very wide 21mm equivalent at the wide-angle end of the lens and zooms to 1365mm equivalent at the telephoto end of the lens. The aperture range is f/3.4-6.5, and the lens offers an impressive 0cm macro focus. Optical image stabilisation (OIS) is said to give up to 5-stops of image stabilisation. There's also 5-axis Advanced Dynamic IS. The camera now features a 20.3mp BSI CMOS sensor, which gives more resolution than the SX60, which has a 16mp sensor. The new sensor means the camera can shoot 4K UHD video. 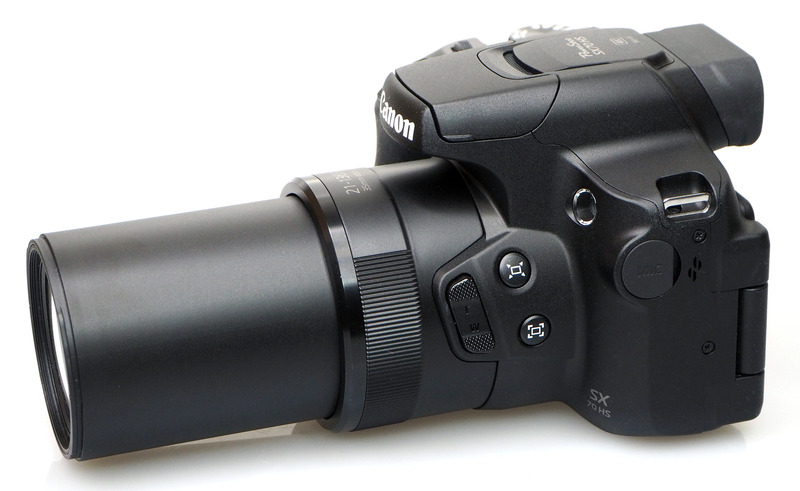 Other updates include a new zoom control on the left side of the lens barrel. The camera offers multiple shooting modes including full manual controls, with P, A, S, M shooting modes, as well as Auto, scene modes, and digital filters. Raw is using Canon's new compact-raw format (cRAW), so you will most likely need to update your raw processing software or use the software provided with the camera. The electronic viewfinder (EVF) has been improved, and is now a 2.36million dot unit, compared to 922K dots on the SX60. There's also an eye-detection sensor, to detect when the camera is held up to your eye so that the camera will automatically switch between the screen and the EVF. Dioptre correction is available. The vari-angle screen is a fairly standard 3inch screen, with a resolution of 922K dots, however, the screen is not a touch-screen. There is no hot-shoe on top of the camera, something that features on the SX60. The camera has maintained the mic socket, which can be found on the side of the camera. Wi-Fi connectivity is included, but not NFC (something that was included on the SX60). 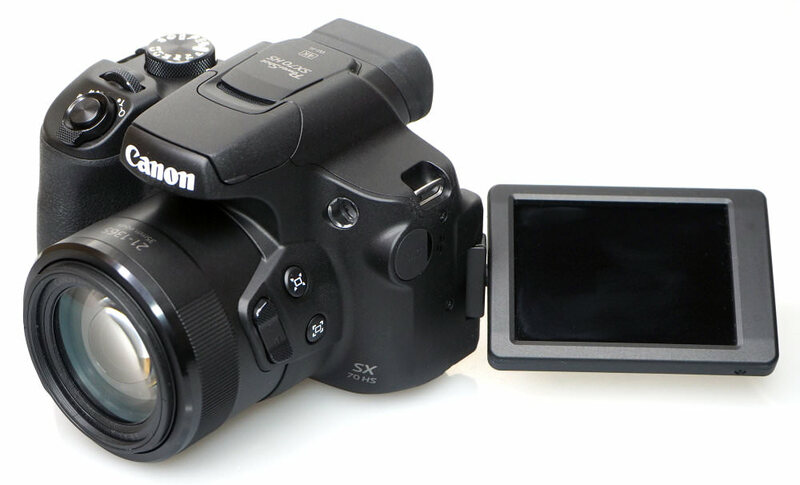 The camera weighs in at 610g including the battery and memory card, making the camera a substantial weight. There's a good size hand-grip with rubber coating, providing good levels of grip when using the camera. You could even use the camera with one hand, but for best results, we'd recommend using two hands, particularly when using the longer end of the telephoto lens. Build quality is good, although some may not like the plastic construction and finish. With this type of camera, this is pretty much the norm, and it's been a long time since any camera of this type was made with metal - Olympus Camedia C-765/770 we're looking at you. The lens barrel is blank, meaning that the focal length is not marked. New to the SX70 is a new zoom control on the side of the lens barrel, giving smoother zoom control. You'll also find the quick zoom controls here that let you quickly zoom out in case you need to find your subject once lost. The controls are neatly arranged and fall nicely to hand. There's a top control wheel, which can take some time to get used to, as most control wheels are where your thumb rests. The top mode dial makes it easy to change between the different modes, and there are two custom modes available: C1, and C2. Focusing - there's a manual focus option, which lets you manually focus, however once selected, if you then use the optical zoom, you have to re-select the manual focus option to get the focus controls back. The menus are similar to Canon EOS cameras, and there's even a "MyMenu" screen where you can add your own favourite settings. The menus are easy to use, and colour coding makes it easy to see where you are within the menu system. The screen resolution of 922K dots may not be up there with some other premium cameras, but the view is clear, colours are good, and the screen gives a good view of the scene. You can fold the screen away to protect it when not in use. The screen is not a touch-screen, which is a shame, as most cameras now feature a touch-screen, and can make cameras quicker and easier to use, particularly for selecting a focus point. 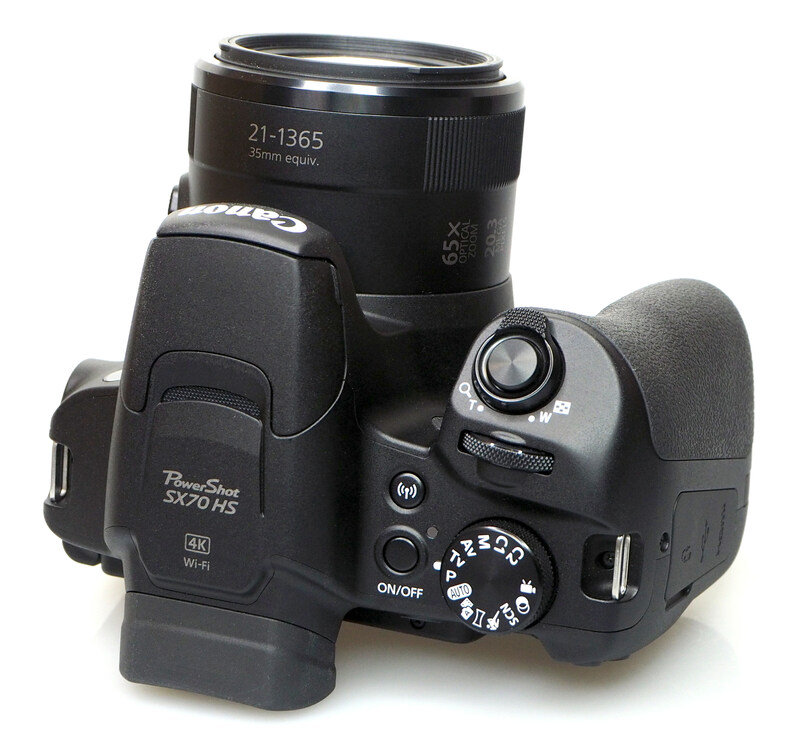 The electronic viewfinder (EVF) is small, but the addition on an eye-detection sensor makes the camera easier to use, automatically switching between the screen and EVF. Detail shown in the EVF is good, and colour reproduction is also good. Wi-Fi features - Setting up the connection to the camera from a smartphone is quite straightforward, with Canon Camera Connect featuring a built-in guide. You can use the app on your phone to send location data to the camera so that images will have GPS tagging. With built-in Bluetooth, you can transfer images, and this will use less power than Wi-Fi. Battery life - Battery life is rated at 325 shots when using the screen, which can be extended to 405 shots when using the ECO mode. Battery life is much shorter when using the EVF at 255 shots. 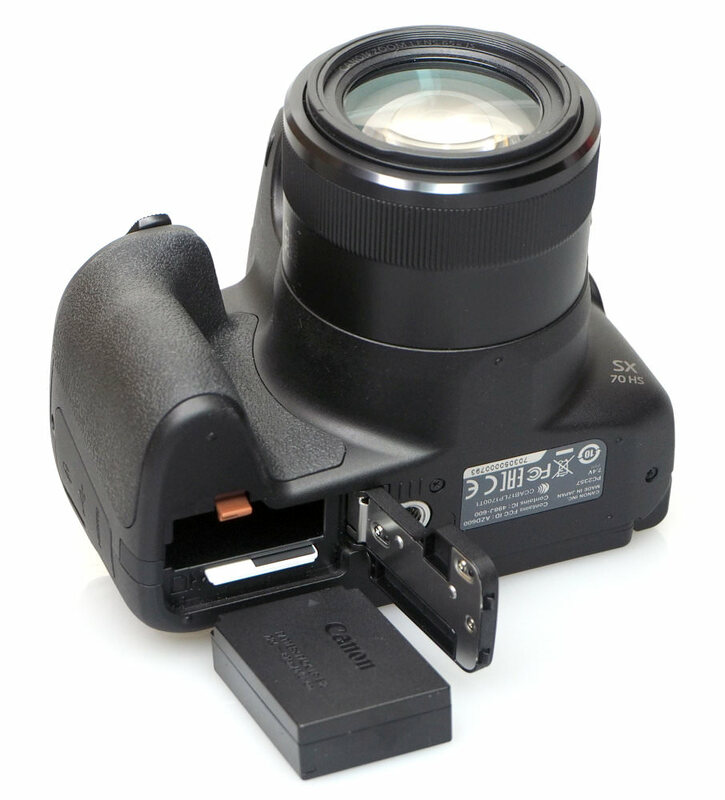 Depending on how you use the camera, for example, if you primarily intend to use the EVF, then a spare battery would be a good idea, however, if you stick to the screen and use ECO mode, then you may not need a spare battery. Speed - Focus speeds are quick when using the wide-angle end of the lens, becoming slower at the telephoto end. Continuous shooting is good at 10fps. Focus struggled at times, and this resulted in some missed shots. It seems to me that what you say is a button fault on not holding focus is normal activation in SERVO mode where it will refocus on hold to follow moving subjects if it detects any movement. To lock button on half shutter button press the camera needs to be set to ONE SHOT in the AF Operation menu choice. I find ONE SHOT to be the best mode to use unless there is a specific need for refocusing on moving subjects with these Canon cameras. Can you confirm that the focus was set at ONE SHOT when focus was shifting and if it was set as SERVO you need to re-write this review as there is no fault with the shutter release button. It seems to me that what you say is a button fault on not holding focus is normal activation in SERVO mode where it will refocus on hold to follow moving subjects if it detects any movement. To lock button on half shutter button press the camera needs to be set to ONE SHOT in the AF Operation menu choice. I find ONE SHOT to be the best mode to use unless there is a specific need for refocusing on moving subjects with these Canon cameras. Can you confirm that the focus was set at ONE SHOT when focus was shifting and if it was set as SERVO you need to re-write this review as there is no fault with the shutter release button. Expensive as a concept is relevant to disposable income. I trust it costs less than a mission to the moon but surprisingly from the pictures users have uploaded no-one seems to have attempted to reach the moon! How strange! Birds people, show some courage, go shoot lions! (Does anyone remember the Olympus print advert for their bridge cameras with the slogan "Look braver than you are"? Expensive as a concept is relevant to disposable income. I trust it costs less than a mission to the moon but surprisingly from the pictures users have uploaded no-one seems to have attempted to reach the moon! Birds people, show some courage, go shoot lions! (Does anyone remember the Olympus print advert for their bridge cameras with the slogan "Look braver than you are"? No answer on my focusing query. The total sum of the focusing raised as an issue was:- "[i]Using auto-focus, if you tend to pre-focus your shots (by half-pressing the shutter release button), and then fully pressing the shutter release button, the camera has an annoying habit of refocusing for you, after you've fully pressed the shutter release button. This appeared to be an intermittent issue, and would randomly happen some of the time, but not others. Other people in the office who tested the camera found the same issue[/i]." All rather vague I think. No indication the reviewer worked the problem or was even aware of the existence of or how to set up different focusing scenarios on this camera. I hope people look around and think how much effort has gone in to getting the best out a camera in a review as any user will be able to do this at their leisure and get better results. I think getting any subjective in depth reviews of this sort of camera or anything under £1,000 is going to get more difficult in this current move to high margin kit. Notice how in cameralabs the SX70 and HX99 reviews have dropped off the radar. I have a Panasonic FZ82 myself but I am sure the SX70 will give good service within its class and this review does not give much indication on the supposed focusing issue that any investigation was done in to it so look around as always to get the real picture. No answer on my focusing query. "Using auto-focus, if you tend to pre-focus your shots (by half-pressing the shutter release button), and then fully pressing the shutter release button, the camera has an annoying habit of refocusing for you, after you've fully pressed the shutter release button. This appeared to be an intermittent issue, and would randomly happen some of the time, but not others. Other people in the office who tested the camera found the same issue." All rather vague I think. No indication the reviewer worked the problem or was even aware of the existence of or how to set up different focusing scenarios on this camera. I hope people look around and think how much effort has gone in to getting the best out a camera in a review as any user will be able to do this at their leisure and get better results. I think getting any subjective in depth reviews of this sort of camera or anything under £1,000 is going to get more difficult in this current move to high margin kit. Notice how in cameralabs the SX70 and HX99 reviews have dropped off the radar. I have a Panasonic FZ82 myself but I am sure the SX70 will give good service within its class and this review does not give much indication on the supposed focusing issue that any investigation was done in to it so look around as always to get the real picture.